· What makes a proper boot pick ? you?d be surprised! · Tents and a shelter emergency! · Taboo Topics: Taking a C**P in the woods and other topics EVERYONE wants to know about but are afraid to ask?. o Ladies? Aunt Flo visiting?? What to do in the wilderness? And so much more we don?t have room to list it all. Of course, as usual, there are many more up-close tips and techniques that are covered that will help you to get ready for your camping trip. Once you see this DVD, you?ll want to start getting ready for your outdoor experience! Not only is this video informative, it is FUN to watch and you will wish you were there with us! Even as an experienced backpacker, you WILL learn A LOT from this DVD. 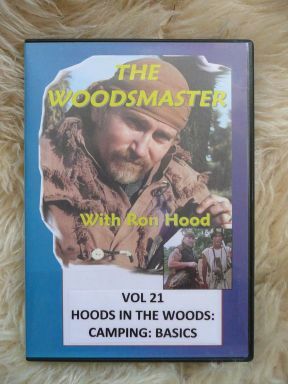 This is a Must Have DVD for any person or family who ventures out into the woods! This is part one of our new Camping series in which we will drill down to topics you never dreamed of or always wanted to learn about! This DVD is over an hour and a half of jam-packed, up-close instruction that you will not get anywhere else unless you go up in the mountains in person with us!